Polypropylene (PP) is the most widely used artificial grass on the market, mainly because it is the least expensive product. 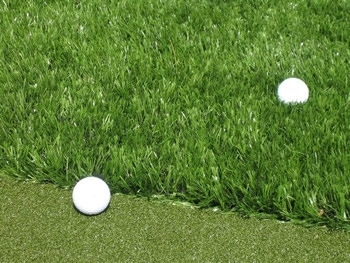 Some companies use PP as a putting surface due to its low cost. PP does not have the wear resistance of Nylon. PP has a melting point of about 155 degrees fahrenheit so the manufacturing procedure restricts the fibre directionality. This means that the finished product will have a significant nap or grain which will affect the roll of putt. In addition to this property, PP fibres do not have 'memory' which means that over time the fibres will try to lay flat the more the putting green is walked on. To counter this, PP greens rely heavily on the sand infill to assist the fibres to remain vertical. The effect of the flattened fibres will mean that the speed of the ball roll will increase over time. It is therefore necessary for more maintenance of a PP green with regular brushing to 'stand up' the fibres. 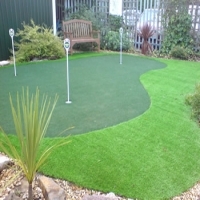 Polyethylene (PE) has the unique property of being 'soft' textured and is therefore very popular for artificial grass lawns and play areas. It also makes an excellent fringe surface around putting greens. It is most commonly used with a sand infill to hold the material down and help the fibres stand upright. It is not commonly used for putting greens. PE is a more expensive material than PP but less than Nylon. Nylon is probably the strongest artificial turf on the market. Nylon can tolerate heat and friction better than any other turf. The high manufacturing temperature (250 degrees fahrenheit) sets memory into the fibres which helps to minimize the matting effect you can get with other artificial turfs. The result is that there will be minimal alteration to the putting speed over time. The addition of sand infill allows the putting green to be set up to the customers specific requirements providing a smooth roll in all directions. Nylon turf is more expensive than PP or PE but provides a higher standard putting product. We use Nylon for the Merit Easy Install Putting Greens. Our policy is to provide the best surface that we can for our customers. As a result of our development program, we have been able to produce a putting green surface that can also be used for chipping and full shots. The customers can have the performance parameters that they require from the one product. Nylon is also the material of choice for our Tee Mats. With the benefit of its strength and wear resistant properties, Nylon provides the best option. Because of the characteristics of Polyethylene, Merit Golf uses this artificial turf for the fringe surrounds of the greens as well as for Lawn and Landscape applications. Do you recommend a shock underlay for your nylon putting grass? What is your price for 100 sq meters of nylon putting grass? @Mike: A shock underlay is not required under our Putting Greens. You will need to email us directly with your price question. We have 2 different products for different applications. Most recent generations of artificial turf have underdone strict environmental testing to include lead and mercury. The issue of lead mostly resides in the rubber crumb infill that could be found in older versions of synthetic grass. Now you have the option of various sand infill or none at all. The issue of lead mostly resides in the rubber crumb infill. No doubt Nylon is the best artificial turf.